WASHINGTON — North Carolina Gov. Roy Cooper made good on a bet with Virginia Gov. Ralph Northam on Tuesday — after getting a gentle hint. Northam began Wednesday’s Ask the Governor program on WTOP by commiserating with co-host Mark Lewis about their NCAA Men’s Tournament brackets — specifically, the damage that the performance of the Virginia-based teams had done to them. Northam said he had one consolation, though: He’d won a bet with Cooper on the outcome of the Virginia-North Carolina ACC men’s tournament finals, and had a six-pack of North Carolina craft beer coming to him. But he couldn’t help pointing out that he hadn’t actually gotten the prize yet. Never let it be said that Cooper’s not a man of his word — or that WTOP doesn’t get results. 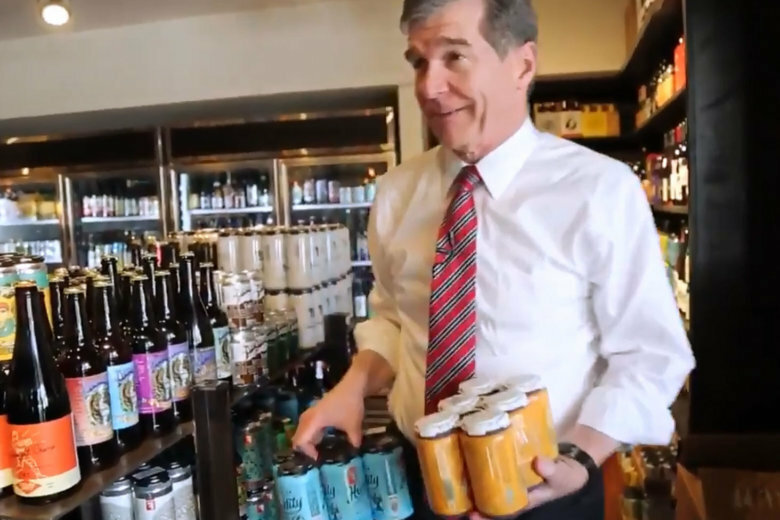 Cooper on Wednesday picked up a six-pack of Mother Earth, in Cavalier orange cans, and grabbed some Fullsteam, in Carolina blue, as well. And he sent them off to Northam. Or at least he said he did. We’ll see. At last check, Lewis is still hosed.